First Baptist Church Pulaski – When Will We Cry? 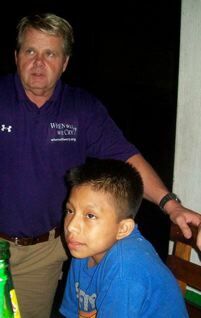 David Mitchell called in last night and gave me a report of their progress in Nueva Florida. 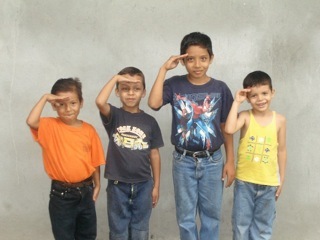 There are 17 gringos mixing it up (no pun intended), doing construction work, and evangelism this week in Guatemala. 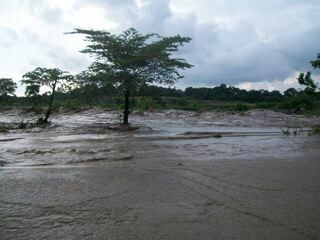 The rain had been coming very hard everyday by 1pm or 2pm for the last couple of weeks. Our plan was to start work by 5am and work until the rains came. Though, I had prayed and asked the Lord to hold back the rain just a little (“Oh, ye of little faith”) then I thought, just in case, the plan to start early would be a good one. Especially since I’d be coaching from the side line. The guys did their part and so did God. The team ended up working from 5am to 5pm Monday and Tuesday. The rain held off and the work continued, but two 12 hour days of exhausting labor and triple digit temps can take it’s toll. Last night David said that they were just a bit exhausted. Today, they were to have a shorter construction day because they were having a tamale fellowship/gringo gospel time. No word yet on how all of that has gone. Monday : Several tons of rock and sand arrived at the job site. As the truck loaded with sand backed it’s way up the small road, a portion of the road caved in, thus, getting the truck stuck. The only thing to do was to move the sand by wheel barrows the last 100 yards—slightly up hill. After that task was finished the gravel truck fearing he would meet the same demise also stopped 100 yards short so the team moved the gravel the same way. David said that some of those young Texan bucks turned it into a race… one he was glad to let them win! David said to make sure and tell everyone thank you for all the prayers. They are accomplishing more than expected by the Lord’s grace and strength. Nueva Florida is one of those hard areas that has rejected the gospel. The pastor started his work there just a few years ago and his church is growing. I know that because of the testimony they are witnessing of these Americans who have come and are working so very hard in their village, that many more will open their hearts to the gospel of our Lord and Savior Christ Jesus. Thank you for your prayers and support! May our Lord be glorified in all we do! To Him be all glory. 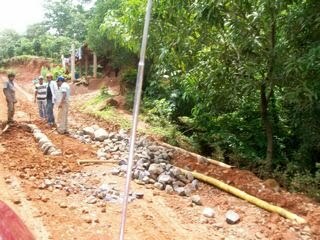 You’ve heard me talk many times before about the driving conditions in Guatemala. It’s like Talladega and the Indy 500 all in one. There is no safe driving distance in following the car in front of you because any space that you allow is considered fair game. It’s a battle for position. It makes no difference if the bus is stopping 50 feet away, he will cut in front of you anyway. Cars scream bumper to bumper, motorcycles weave in and out of traffic like a spider weaves a web, and unless you learn to drive –a bit as they do– you’ll be caught in the web like helpless prey. The only things that slows people down are road conditions and tumulos’s –speed bumps on steroids. While driving one must pay attention, something no longer required here in the states. Driving requires a constant state of alertness –meeting cars in “your” lane is common, as is being passed on the right and the left simultaneously. Pot holes–a deadly hazard, can cripple and maim. Drivers constantly maneuver, taking extreme measures to avoid these deadly craters, but sometimes, no matter how well you know the road or how you drive…..the inevitable happens. Thus was our predicament, on Sunday, July 4, as we caravanned to the coast last week. While driving the rental van a crater appeared sudden and deep. It swallowed half of the road. I braked hard and swerved to the right. We hit the giant hole hard. Though it jarred us a bit fortunately we escaped any damage. Our blue van, that followed, with other team members, also hit the deep pot hole, and it’s condition wasn’t quite so favorable. 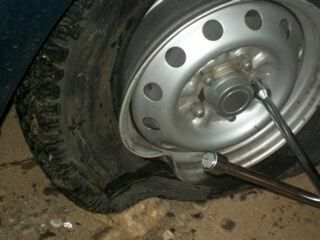 Within minutes the two damaged wheels produced flat tires. At a safe pull over place, the guys worked on one of the bent wheels as the rain started again. They were able to beat the best one back to where it would hold air. 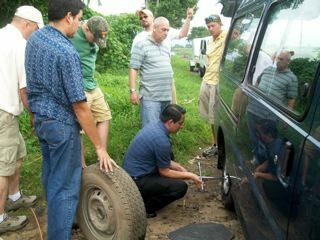 We used the spare tire to replace the other damaged wheel and after an hour we were back on the road. One never knows what lies around the next curve on Guatemala’s highways and by-ways. It’s sort of like life–no one knows what tomorrow holds–but we who know Christ Jesus as Lord, know Him who holds tomorrow and everyday after. Thanks for listening. We appreciate your prayers and support so very much. Wednesday night we went for tacos in Malacatan. 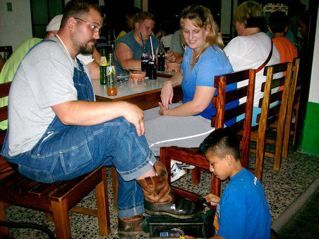 While there we ran into David, the shoe shine boy, again. Brad Haney got a boot shine and blessed David with10Q — around a buck-fifty. David only charges 2Q, or 24 cents. 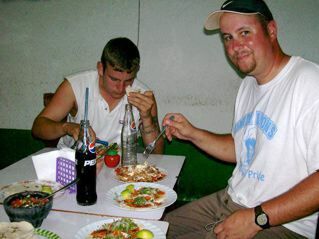 It was taco time in Guatemala so we all had supper together afterward. It was raining that night so after supper we ask David if we could give him a ride home. After some hesitancy he agreed so we all got in the van. I’m still not sure about his hesitancy, but the trip to his house was much more than we bargained for. There were no street lights, dark clouds blocked any moon light and the darker it became the worse the road was. 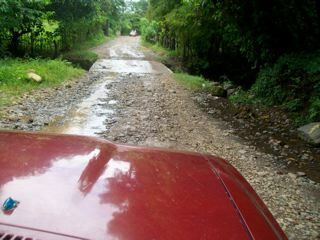 With the muddy conditions the narrow road finally became too treacherous to continue. With the Lord’s help we maneuvered the van backward to an area where we could turn around. It took some doing but we did get David home that night. The next morning we called his mom and and asked if we could come and see them. The next morning, after breakfast, we made the journey back to David’s house, pictured left. We drove the 4×4 trucks and still had one questionable mud hole to pass through. We did arrive though and met his mom and sisters for the first time. After some conversation we found out that his mom was a Christian and that David had told her about the Americans buying him food and sharing Christ with him. She said that since he had prayed to receive Christ, back in April, that he had started going to church with them. Sunday is David’s only day off–Monday thru Saturday, between school and work he is gone 12 to 13 hour days. Quite a task for a 12 year old. Pictured below is David, his mom and three sisters. David has a stepdad who was out working. We returned to Piedra Partida for a quick lunch before heading to Buena Vista to deliver the food. 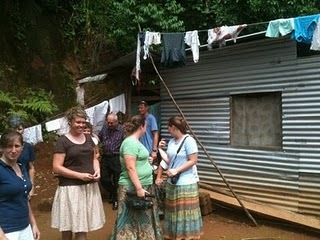 This would be our final day there and the church had planned service in our honor. 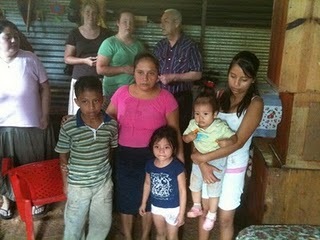 At Buena Vista we worshiped together, Ely preached and afterward we gave the food to the families. What looked like nothing to us would help these folks stretch their monthly needs, and perhaps give them an opportunity to share Christ with their neighbors. I will send an update later with pics of the service and food distribution. This week is all but spent, and so are we, but there’s nothing better that I can think of to pour your time, energies and resources into other than the labors of our Lord.